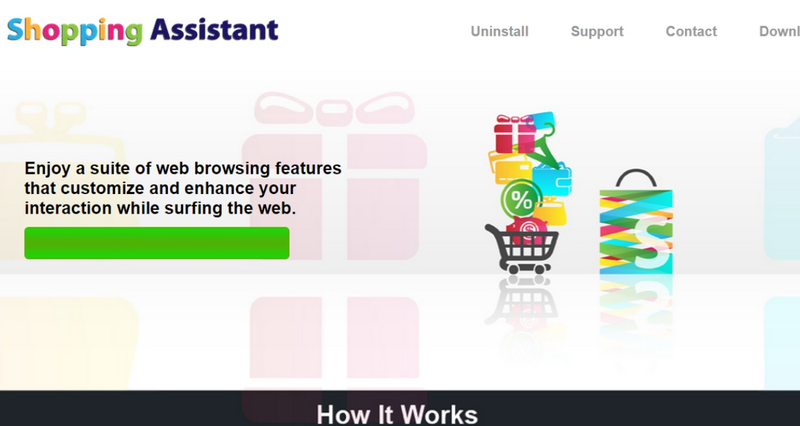 Shopping Assistant is a typical adware-type application developed on the SuperWeb engine. It is designed to generate and display ads on the Internet. This adware is not a virus, although it is far from being useful. It is compatible only with Mozilla Firefox and Internet Explorer – Google Chrome can’t be affected by it. However, you may never know when the developers will release an update that would make the adware infect Chrome. Whichever browser you use, be sure to remove Shopping Assistant as quickly as possible because of a number of dangers it can put you in. Also, you should not believe a word the suspicious adware says: it tries looking decent and reliable, and many users fall for this trick. Shopping Assistant claims to enhance your browsing experience by providing you with discount offers that should help you save money. In reality, the aim of the program is not to help people with their savings – the adware collects revenue by using pay-per-click system. Why is Shopping Assistant dangerous? There are many reason why users delete Shopping Assistant. First of all, the ads the program displays bear no benefits to the user. Sure, the banners, pop-ups, and coupons may seem to advertise exactly what you need, but all of this might be just a scam. If you click a third-party advertisement, accidentally or not, it can redirect you to a website that may be corrupted. Corrupted websites spread malware, viruses, adware, browser hijackers, and Trojans all over the Internet. If you don’t want to become a victim of infections, you’d better uninstall Shopping Assistant before it’s too late. Keep in mind that it is especially dangerous to click on fake software update links. In addition, there is a high chance that the adware collects non-personally identifiable information. This kind of info includes URL and IP addresses, search queries, and so on. By using this technique, the program generates ads that you would want to click. How did I get infected with Shopping Assistant? There is no possibility of downloading Shopping Assistant from its official website because the download link simply doesn’t work. This means that there is no doubt that the adware is spread bundled with other applications. When users download freeware, they usually don’t pay enough attention to the installation. This is a huge mistake: in this way, various PUPs sneak into their computers unnoticed. Be more attentive the next time you download free software and choose Advanced or Custom installation types. How to remove Shopping Assistant from my PC? Navigate the mouse to the lower-right corner of the window. In the Charm bar, choose Settings.